Welcome to Casa de Perainda! 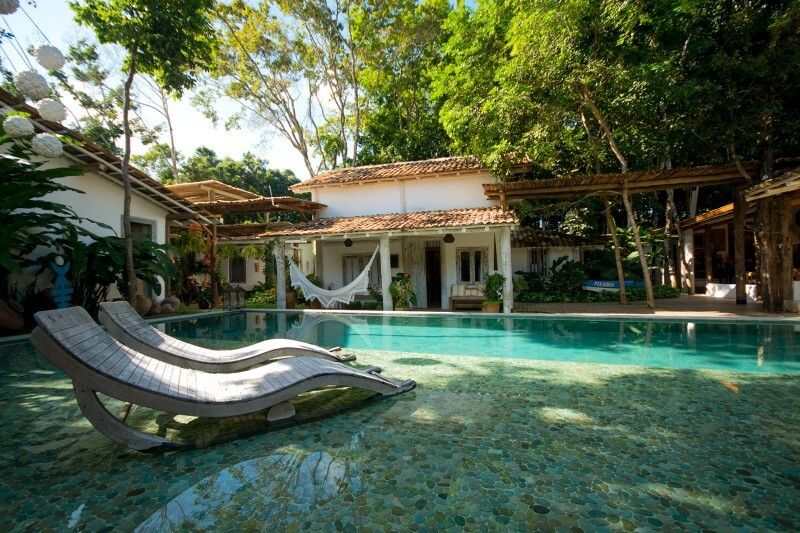 Casa de Perainda is one of the most delightful hostels in Trancoso, Bahia! Designed and built with a great respect for nature, architecture and regional customs, the end result is amazing. The rustic building is created from recycled tiles, burnished cement flooring and reclaimed wood. The decor features antique furniture from the golden age of cacao, art objects from several artists of national renown, and a lot of charm. The pool is directly accessible from the large hall. Ionically treated, it is coated with Pallimanan, a volcanic rock from Indonesia and known here as a green hijau. This gives the water a shade that is very close to the color of the sea on sunny days. While exploring the gardens and balconies, guests will discover wooden benches and cushions, hammocks, and loungers. Combined with the lush green foliage, it is the ideal place to relax, read, and simply rest. At Casa de Perainda we want you to feel like you are at home, with privacy, personalized service, and an exceptional hospitality experience. Privileged location, 450 meters from the emblematic "Quadrado", in one of the most pleasant residential districts of this village, it gives you tranquility, comfort and a feeling of being in the middle of a tropical forest. Personalized service and an exceptional hospitality experience!